Read about how to make the future simple here. 1: We use the future simple with 'will' to predict the future. It is the basic way we talk about the future in English, and we often use it if there is no reason to use another future tense. We can use it for future facts and for things that are less certain. The sun will rise at 7am. I think the Conservatives will win the next election. 2: Promises / requests / refusals / offers. This is sometimes called 'volitional' will. It's about wanting to do something or not wanting to do something in the future. I'll help you with your homework. In a similar way, we often use 'will' when we're talking about a decision at the moment of speaking. We are usually making an offer or promise or talking about something that we want to do. A: I'm cold. B: I'll close the window. 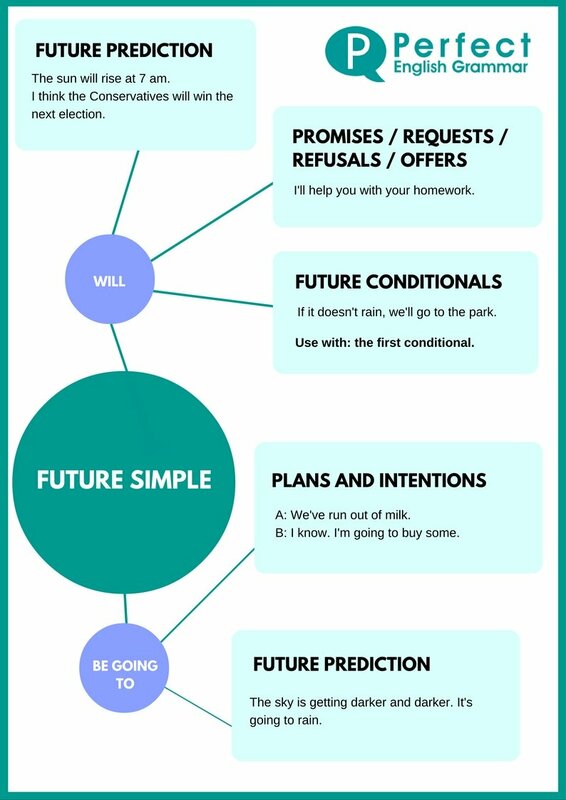 3: We use the simple future with 'will' in the first conditional, and in other sentences that have a conditional feeling. If it doesn't rain, we'll go to the park. Let's arrive early. That will give us time to relax. 'Shall' is used mainly in the forms 'shall I?' and 'shall we?' in British English. These forms are used when you want to get someone's opinion, especially for offers and suggestions. 1: We often use 'be going to' to talk about our future intentions and plans. We have usually made our plans before the moment of speaking. A: We've run out of milk. B: I know, I'm going to buy some. 2: We can also use 'be going to' to make a prediction about the future. Often it's possible to use both 'be going to' and 'will' but it's more common to use 'be going to' if we can see evidence in the present. Look at those boys playing football! They're going to break the window. The sky is getting darker and darker. It's going to rain. Read more about the different ways of talking about the future here. Try some exercises about the future here.